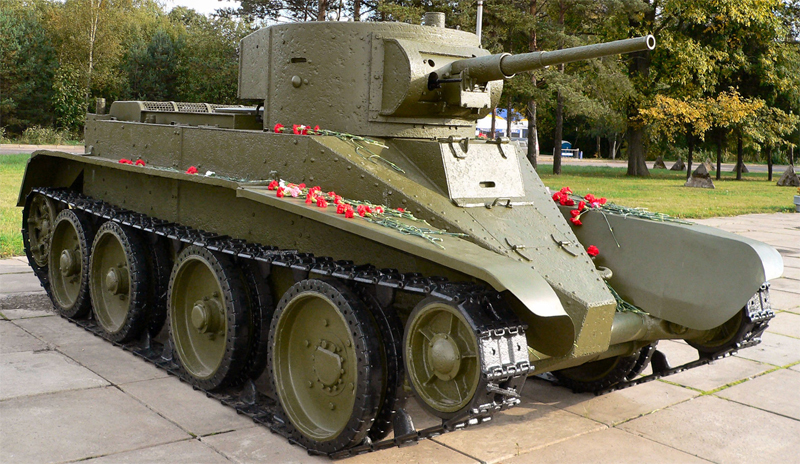 The BT-5 (Bystrochodnij Tankov or “Fast Tank” type 5) was an improvement on previous models. These were themselves close-copies, with specific modifications, of the US Christie M1931 “race tank”. The BT-5 shared with its predecessors the suspension, the hull (though slightly reinforced) and equipment. The turret was new, roomier and fitted for the first time with the standard 45 mm (1.77 in) gun, also used on the T-26. But this transition was not clear-cut. The BT-5 was preceded by the BT-4. Three prototypes of the latter were built in 1932 with a partially riveted, partially welded hull and modified suspension. Profile of a BT-5, late type. Aside from the turret, the BT-5 could hardly be distinguished from its predecessor. The hulls were identical, with the same internal arrangement and the same Mikulin M5 engine, supplying 400 hp (298.4 kW). The armor was unchanged, ranging from 6 to 13 mm (0.24-0.51 in), in no way capable of withstanding even antitank rifle fire. Speed was seen as active protection. 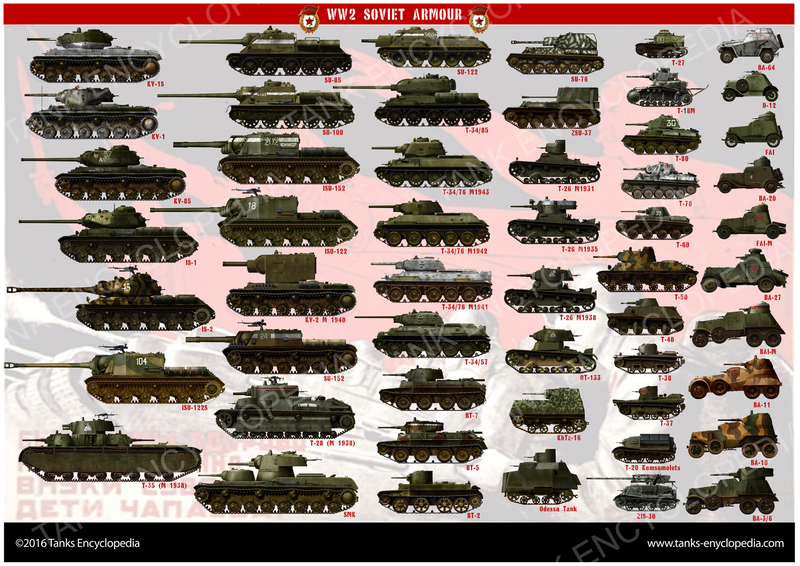 The big difference was the turret, similar to the model 1933 T-26 two-men turret with a 45 mm (1.77 in) model 32 gun, the new standard Soviet AT gun. 115 rounds were carried. Commander tanks, which had a radio 72. A DT-5 coaxial machine-gun completed the armament. The gun had a single episcope. There was no commander cupola, just simple escape hatches. 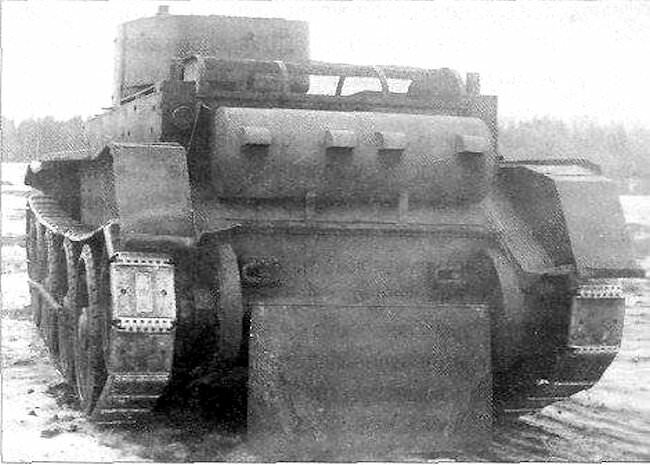 The turret itself increased the overall weight to 11.5 tons, and performance degraded accordingly. Top speed was 72 km/h (45 mph) instead of 100 km/h (62 mph). The fuel tank shrank to 360 liters (95 gal) from of 400 l (100 gal). The engine now gave a 35 hp/ton ratio and maximum range was decreased from 300 to 200 km (tactical range 90 km) (186/124/56 mi). But all this was sacrificed for largely improved firepower. Like the previous model, production was assumed by KhPZ (Kharkov). Early models were provisionally fitted with an enlarged cylindrical turret (single hatch, with or without basket) and BT-2 heavy steel roadwheels. But soon after this first series, UMM instructed the design teams in Leningrad and Kharkov to adapt their model to a common turret. Thus the early model 1933 was introduced, criticized later for its awkwardly placed hatch and inadequate stowage. The roadwheels were replaced by new, lighter convex models in 1933, which were used to upgrade the BT-2 as well. By 1934, the OKMO team had developed a better turret, with a large bustle and twin hatches, also shared with the T-26 until 1937. These were fitted to already existing vehicles . The commander tanks could be distinguished by their turret horseshoe antenna and 71-TK-1 radio set. There are still conflicting issues with the final production numbers, varying from 1884 to 2018. Steven Zaloga and most sources seem to point the former number. Aside from the commander variant, several prototypes and short series were tested and built. The BT-5PKh was an amphibious variant, fitted with a snorkel and completely waterproof. They were tested for large river fording. The BT-5A was the artillery support variant. Like the previous D-38 derived from the BT-2, a modified turret equipped with a short-barrel 75 mm (2.95 in) howitzer, similar to the one used by the T-28, was fitted. There was a commander variant of the latter, equipped with a horse-shoe antenna and similar radio set. A small-scale series was built in 1934. The HBT-5 was a prototype-only flamethrower variant. The RBT-5 was the rocket launcher version. Two prototypes were tested, one with a pair of heavy rocket installed on the turret, or two light ramps for longer range models similar to the “Katyusha” standard type. Due to the greater availability of the BT-5, many prototypes were tested, like a bridge-layer and radio-controlled version, gas or smoke vehicles, etc. 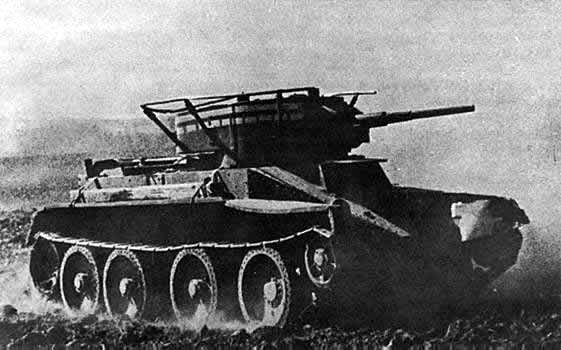 The BT-5 entered service in 1933 and, with gradual deliveries until 1935, equipped all armored cavalry brigades. The first active engagements came in Spain, in 1937, when a batch of 100 was shipped to the Republicans. They took part in the defense of Madrid. Some were captured later and saw service with the Nationalist Spanish state. Two brigades (6th and 11th Tank Brigade) were sent in the Far East, on the Sino-Russo-Mongolian border, to face Japanese incursions of the time. They proved instrumental at Khalkin Gol, with many BT-7s, proving too fast for the Japanese AT teams and still deadly for any AVFs deployed. However, they proved vulnerable to “close quarter” Japanese teams armed with Molotov cocktails. Not long after, they were deployed in eastern Poland. They also soldiered during the “Winter War” in Finland, proving ill-adapted for the task with their thin armor. Losses were appalling. 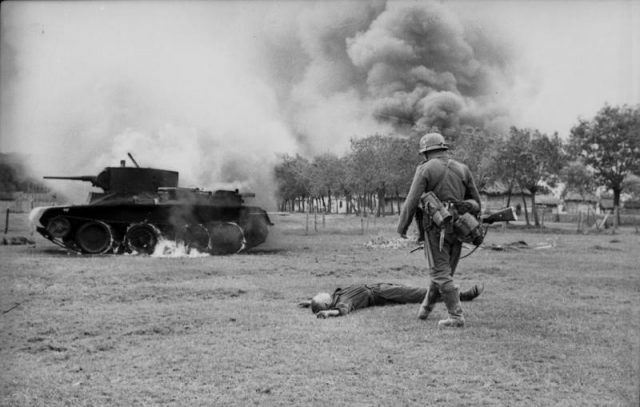 Finnish troops used Molotov cocktails as well and quickly found a weak point where the engine was installed, prone to catch fire and explode when hit, as shown in reports. In 1941, there were still hundreds of BT-5s in service despite the type having been replaced by the BT-7. But hundreds were lost or abandoned, worn out, during the summer offensive, liquidating what was left of the model. Only the lack of spare parts prevented the use of surviving vehicles until later in the war. The Soviets were working on explosive dogs as a way to attack tanks back in the 30’s. They would train dogs to hide under tanks and then set off explosive carried on their backs. They also thought those other nations would also try this I.E.D Improvised Exploding Dog tactic. To that end, they tested several methods of stopping dogs getting under their tanks as can be seen in these photographs. They settled for equipping early BT tank crews with sawn-off shotguns as a more cost effective option. In the long run, the idea proved useless on the battlefield as the dogs panicked when exposed to real gunfire and ran for safety to the most familiar sights they recognised, notably the Russian tanks they had trained with leading to some early losses of Soviet tanks. The Tank Museum archives, Bovington, England. BT-5, early pre-series vehicle (1933), with the early heavy type roadwheels and cylindrical turret with basket. BT-5, early type, with the cylindrical turret. One of the 100 BT-5s sent to the Spanish Republicans in 1937. This one was part of the 3rd Bandera Aragon, later captured by the Nationalists. A BT-5 model 1933 from the Spanish Nationalist forces, 1938. The turret roof was painted white with a large black cross. BT-5 TU Model 1933, radio command version, Khalkin Gol, August 1939. 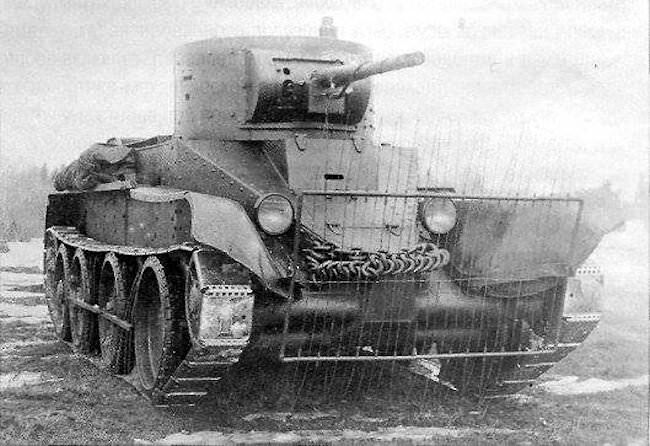 BT-5, late production version equipped with the T-26 turret, Southern Front, spring 1942. Notice the wooden beam, attached with leather straps. BT-5 model 1934 in winter camouflage, Winter War, Finland, December 1939. Camouflaged BT-5 model 1934 of an unknown unit, summer 1941. BT-5, late type, Ukraine, summer 1941. “Forward to Victory” slogan. 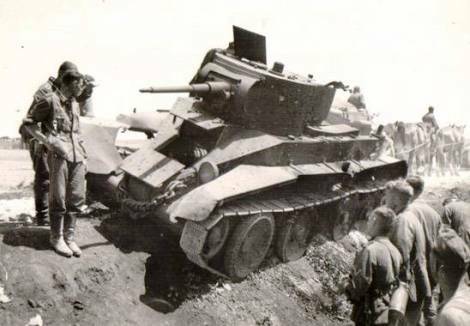 BT-5 with a three-tone camouflage, British-Soviet Invasion of Iran, August 1941. 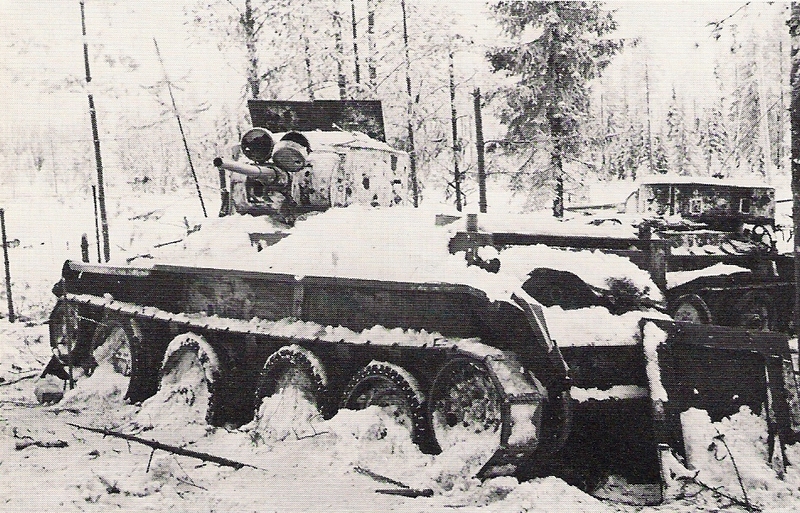 BT-5, late model, stripped winter camouflage, December 1941. BT-5A, howitzer support version, summer 1941.